While our calendar of exercise and fitness classes demonstrates our desire to help our residents maintain optimal physical health, we want to help our residents achieve true overall wellness. That means we provide many opportunities for them to address the seven primary components of a healthy lifestyle – physical, emotional, intellectual, social, spiritual, environmental, and vocational. We believe wellness is an active process through which people become aware of, and make choices to achieve, a more successful existence. Our goal is to help our residents self-direct this process through the environment, services, and activities we offer, and with the assistance of our full-time activity director. One of the ways we accomplish this is through our unique Personal Preferences program, which gives residents the chance to achieve their own personal fulfillment, whether that is simply taking a boat ride on the river or skydiving. At Magnolia Grand wellness is not just a state of mind, it is a lifestyle. We want to provide our residents with the environment, services, activities and support they need to lead empowered, optimistic, and fulfilled lives. At Magnolia Grand, we understand wellness means more than just taking a daily walk. We believe in the interaction between mind, body, and spirit supported by the 7 Dimensions of Wellness. This holistic belief of mental and physical health ensures our residents enjoy a thriving life of enhancement and joy. Within the Magnolia Grand community, we not only embrace this wellness model but have unique departments dedicated to fulfilling each of the 7 Dimensions. Physical wellness is crucial to living independently. It includes physical activity, mindful nutrition, stress management and regular medical checkups while simultaneously avoiding destructive habits. The Magnolia Grand team is dedicated to safeguarding individuals’ health, security and potential by offering referrals to programs that provide health care assistance as well as transportation to doctor’s appointments as needed. 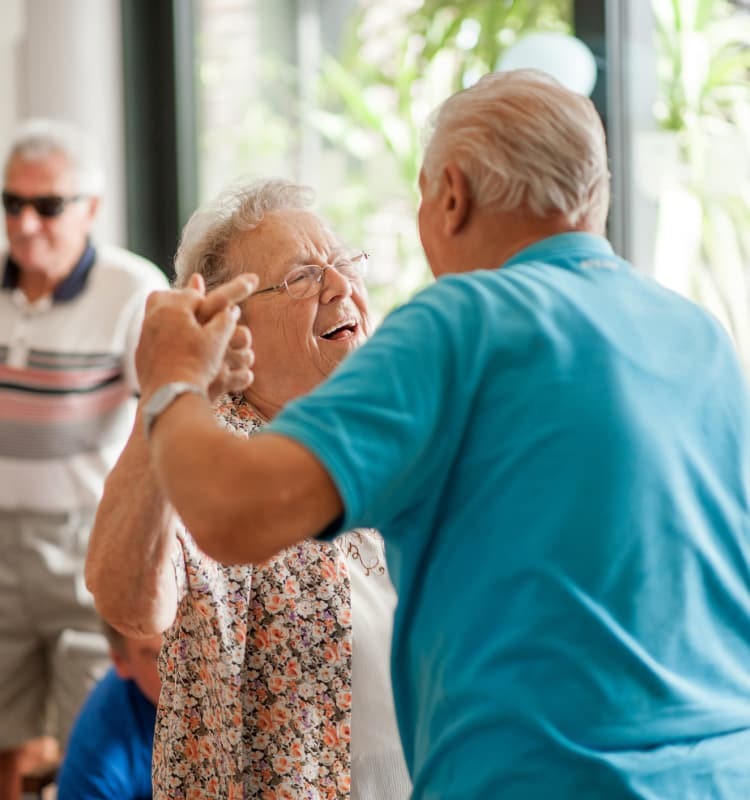 You’ll also find an array of exercise classes, nutritional foods and additional positive-lifestyle options that can maintain or improve health and the functional ability of our residents. A mind that continues to learn, grow and develop is a healthy one and it’s why intellectual wellness thrives on regular participation in creative and intellectual activities. Pursuits such as art, crafts, discussion, and reading keep the mind alert, interested and focused. Magnolia Grand’s Memory Enhancement Program draws on individual interests and abilities to introduce engaging activities that support and improve mental wellness. Residents are also regularly encouraged to engage in new activities tailored to their functioning level to keep their intellectual health robust and resilient. Emotional wellness is an individual’s ability to be aware of and direct his or her feelings to create a balance in life. Coping with challenges and behaving with respect to others are signs of emotional health. At Magnolia Grand, we understand that transitions in life can be difficult and require an adjustment period. To support our residents as they adapt, we offer emotional support through reminiscing, sharing personal histories and socially connecting residents to other members in our community. Enjoying a meaningful and purpose-filled life is vital to maintaining feelings of well-being and connections to those around us. At Magnolia Grand, our activity director ensures residents can continue their spiritual journey in ways that best enhance their life and holistic health. Whether through individual or group faith-based activities, focused exercise, enjoying nature or partaking in personal meditation and reflection, our community’s residents can find the support and guidance they need to sustain their spiritual wellness. Continued social interaction with family, friends, and peers supports an individual’s overall health in ways that few methods can. We understand that importance at Magnolia Grand, which is why we help residents build community relationships through social activities that promote a sense of friendship, camaraderie, and belonging. And if a resident enjoyed regular participation with a social or civic organization such as Kiwanis, Lions, V.F.W. or Rotary before coming to Magnolia Grand, they are supported and encouraged by our caring staff in maintaining those connections and relationships. Engaging in work that provides individual fulfillment and allows a resident to apply their skills and abilities is a key component of ongoing wellness. Older adults are irreplaceable to society as they contribute their wisdom and talents as mentors, teachers, seasoned professionals, and volunteers. Through Magnolia Grand’s Daily Activity Program, residents are encouraged to engage with the community by way of endeavors that call on their experience and expertise. Whether it’s mentoring younger generations, teaching classes or volunteering to read to children, residents at Magnolia Grand know they’re using their hard-won abilities to give back to themselves and society. Active living that includes the outdoors and stimulating inside environments is a central building block of a fulfilling life. Magnolia Grand’s community design brings individuals into natural and inspiring environments as often as possible. The establishment of faith-based services and devotionals utilizing the beauty of our environment—both inside and out—helps bring a sense of peace and balance to our residents’ lives. At Magnolia Grand, each of our residents’ paths are unique and we pride ourselves on providing the highest quality individualized care to support and enhance self-empowerment, personal growth, and holistic wellness. We look forward to working hand-in-hand with you and your loved ones on this remarkable journey.